This exquisitely detailed tapestry "Morris Medley" is a work dedicated to the art of William Morris, by Julianna James. We see panels from sumptuous works by Morris, including his acanthus leaf wallpapers, exotic plant wallpapers and tapestries featuing the famous motif of acanthus leaves. In the top left panel for example, you can see the exquisite detail of the acanthus leaves, revealing itself though a variety of reds and golden browns. The red blooms in the lower panel are equally detailed, and contrasts beautifully with the greens and olives. The golden acanthus leaves in the top right section are equally beautiful and we see flowers and an owl peeping through the foliage. 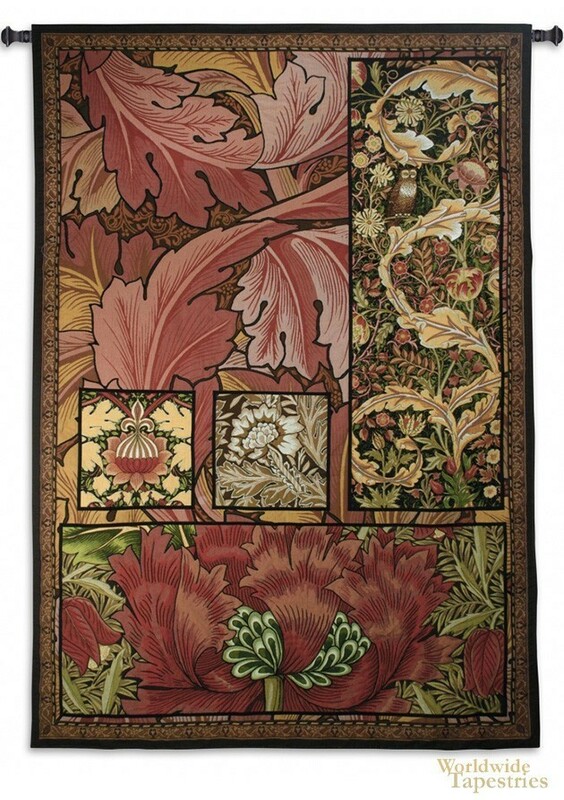 A truly stunning work that is a celebration of the unique beauty of William Morris' mastery on the acanthus leaf theme. This tapestry "Morris Medley" is backed with lining and a tunnel for ease of hanging. Note: tapestry rods and tassels, where pictured, are not included in the price. Dimensions: W 53" x H 80"